Sometimes, writes Sunder Katwala, names are important. The title of the social integration strategy launched today by Mayor of London Sadiq Khan is ‘All of Us’. That send a strong signal that the strategy, to be delivered by Deputy Mayor Matthew Ryder, will seek to avoid falling into the familiar trap of the integration debate, which is too often about ‘us and them’, so that integration sounds like it is a question of ‘migrant and minority affairs’ with the occasional nod at the responsibilities of a white British ‘host community’ too. That won’t make much sense in London. A successful integration strategy for the capital has to be about everybody, or it isn’t really about integration at all. It needs to work for born-and-bred Londoners, who’ve lived here all their lives – white British, black and Asian – as well as newer arrivals to the capital, with different ideas about how they will fit in, depending on whether they have come from Sunderland or Syria. There are a million European nationals in London too, often still discombobulated by Brexit, but maybe more at home in a capital city where many other Londoners seem to be finding it tricky to adjust to that shock too. Both Sadiq Khan and Communities Secretary Sajid Javid have joked about their common heritage, that “you wait ages for the son of a Pakistani bus driver and then two show up at once.” The same is now true of integration strategies, with Javid’s Integration Green Paper launched earlier this week, commencing a 12-week consultation period with pilots in five areas across England including London’s Waltham Forest. It would be fair to say that Khan has a head start. London has more confidence that we can make integration work fairly for everybody than any other city in Britain and perhaps across Europe too. Yet the capital is also the city of most churn and most change: two hundred thousand people arrive in London from overseas each year and a similar number come to the capital from elsewhere in Britain. While London is a city of migration and of relative affluence it is also a city of class, ethnic, faith and age divides. A proactive strategy for social integration is much needed. Integration debates often revolve around a stale polarisation between socio-economic inequalities or whether it is cultural identity really matter. Yet being integral to a city must depend on both fair chances and a shared sense of belonging. The social integration approach seeks to fuse these together. The GLA definition has three key components: reducing inequality and promoting fairness and opportunity for all; encouraging active citizenship and community participation; enabling empowerment through positive contact and strong relationships. That a fourth pillar, improving the evidence base by which to measure success, shows that the Mayor and his Deputy are serious about improving integration rather than, as has so often happened on integration nationally, merely paying lip-service to it. Improving evidence and evaluation will, after all, find out whether they fail as well as providing a yardstick for success. Making integration about everybody means finding effective methods to mainstream social integration in the delivery of major policy programmes, such as health, housing and transport policies. 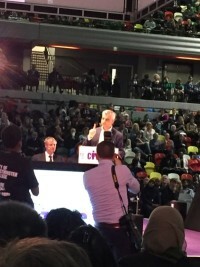 It will also include programmes that target specific needs, such as seeing universal English fluency as an essential foundation for full social, economic and democratic participation in London; as well as those that focus on all Londoners, such as ensuring that more take-up of sport and volunteering opportunities helps increase contact between people from different backgrounds. It also means balancing initiatives that celebrate integration – for example, projecting citizenship ceremonies as an important rite of passage – and those that tackle the barriers and gaps, including the drivers of extremism and prejudice. If anyone can claim to have firmly put #socialintegration on London’s agenda before @SadiqKhan became @MayorofLondon, it is @britishfuture and @sundersays. In that report we said that the Deputy Mayor should focus on increasing Londoners’ civic participation and generating more contact between people of different backgrounds; and that promoting English language learning and greater take-up of British citizenship for new arrivals should be an important focus of the Office’s work. It’s encouraging to see all of this in the document launched by the Mayor and his Deputy today. Whether the ‘All of Us’ strategy lives up to its name will depend, much like the national integration strategy, on the action that follows.